Space shuttle Endeavour stands atop the Shuttle Carrier Aircraft ahead of its flight to Los Angeles in September 2012. Endeavour is destined to be displayed for public viewing at the California Science Center. The space shuttle Endeavour will begin a three-day trip across the United States today (Sept. 19), and you can catch some of that journey —the final piggyback flight ever for a NASA shuttle — live via the Internet. Endeavour's cross-country flight, which will transport the orbiter to Los Angeles where it will become a museum piece at the California Science Center, is the last shuttle ferry flight ever for NASA's space shuttle program. The space agency will broadcast Endeavour's departure from the Kennedy Space Center in Florida on its NASA TV channel and an online webcast today beginning at 6:45 a.m. EDT (1045 GMT). Endeavour will begin its piggyback flight atop a modified 747 jumbo jet (known as the Shuttle Carrier Aircraft, or SCA) at 7:15 a.m. EDT (1115 GMT). 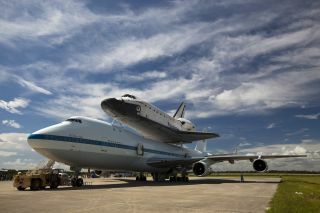 The shuttle is expected to arrive at Houston's Ellington Field around mid-day local time. "Following takeoff, the SCA will head south along the coast and turn back north above the Indian River for one final low pass along Florida's Space Coast," NASA officials said in a statement. "It will pass over Cape Canaveral Air Force Station, Kennedy, the Kennedy Space Center Visitor Complex, and Patrick Air Force Base." NASA will webcast Endeavour's arrival at Ellington beginning at about 11:20 a.m. EDT (1520 GMT), according to the agency's NASA TV schedule. Endeavour's flight from Florida to Houston is the first leg of its road trip to California, where the SCA and shuttle will land at Los Angeles International Airport. The trip has been delayed two days due to bad weather along the flight route. The shuttle's departure from Ellington early Thursday morning (Sept. 20), will not be broadcast live, but its arrival at NASA's Dryden Flight Research Facility in Southern California later that day (about mid-day local time) is expected to be televised and webcast on NASA TV, NASA spokesman Allard Beutel told SPACE.com. Dryden officials also plan to broadcast Endeavour's departure early Friday morning (Pacific Daylight Time) as the shuttle and its SCA head to Northern California to fly over state capitol Sacramento and pass over San Francisco before finally arriving in Los Angeles around mid-day. Endeavour is NASA's youngest space shuttle and flew 25 missions before being retired in 2011 along with the rest of the agency's shuttle fleet. NASA retired its shuttle program after 30 years of spaceflight and plans to relay on private spaceships to ferry astronauts to and from low-Earth orbit as it develops a new rocket and spacecraft for deep-space exploration of an asteroid and beyond.